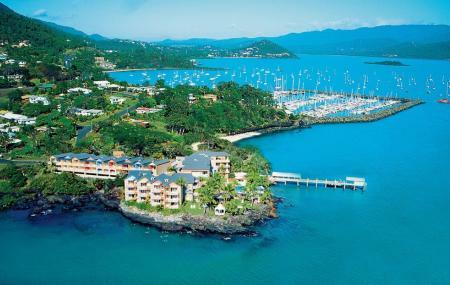 The most popular attraction in Airlie Beach is the manmade lagoon in the heart of the town. The local council, to resolve the problem posed by box jellyfish and other marine stingers in the water that prevented swimming, created it as a safe swimming zone. The lagoon is surrounded by ideal spots for sunbathing, a children’s play area and pool, shaded picnic spots and a sandy stinger-free beach. With no admission fee and open to public 24 hours a day, the lagoon is ideal for a day of fun and relaxation. Airlie Beach Lagoon is one of the most popular attractions in Airlie beach and there’s no way that you can miss visiting here, during your trip to this Australian resort town. As tourists across the globe flock here in huge numbers, to witness the extravagance of this attraction, it is necessary to book the the Airlie Beach Lagoon tour tickets, well in advance. While the tickets for Airlie Beach Lagoon are free of charge, still you can get the Airlie Beach Lagoon tour tickets. Still have questions? Don’t worry and go through our tickets section and get the detailed Airlie Beach Lagoon Tour tickets. The area is a non-alcohol and no smoking environment. Amenities include nine toilets and two showers, a handicapped toilet and infant change room, three change rooms and men's urinal. Lifeguards: 9.00 am to 7.00 pm during winter; 8.00 am to 9.00 pm during summer. Waterson Way is the nearest Bus Stop. How popular is Airlie Beach Lagoon? People normally club together Mr. Bones and Mama Africa while planning their visit to Airlie Beach Lagoon. Wonderful place to take your children. Beautiful location and atmosphere and a great alternative as the beach at Airlie beach is muddy. You have got the shops behind it and the Whitsunday Islands in front of it. It can get a bit crowded but always good for a swim. Life guards do patrol and there is also a kiddy pool. Best place to cool down in Airlie. Very nice but oh so hot. Don't recommend to visit in summer. Forgotten how hot the tropics are, used to live in the tropics a long time ago! Great place for kids and adults. Pretty lagoon with different depths for different age groups. No swimming in the ocean as there are sharks and stingers. Very high chlorine in the pools which may hurt or temporarily damage the eyes. Great places to eat around yet very high prices as it is a tourist destination. Nice lagoon overlooking the sea, perfect for a hot day. Surrounded by shops, bars restaurants and tour shops, it's full of things to do. Multiple lagoons at different depths too which is nice to sit in when it gets really hot.